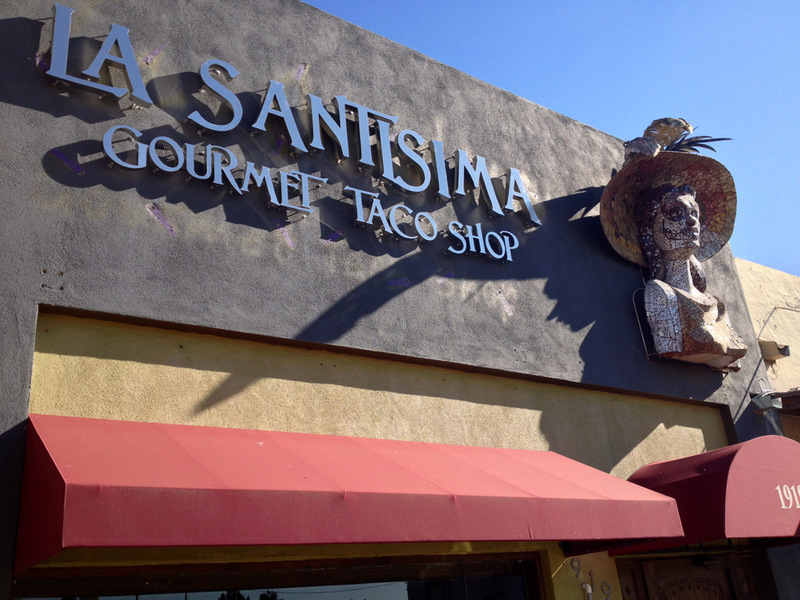 We recently had the good fortune of finding La Santisima Gourmet Taco Shop in Phoenix. We had just been downtown for an event and wanted to get a light lunch in the downtown area.So, using my trusty iPhone I looked up Mexican food in the downtown area… and that’s when I remembered I had bookmarked La Santisima on the recommendation of Sam Clark from Mud Dauber Coffee (just up the street). 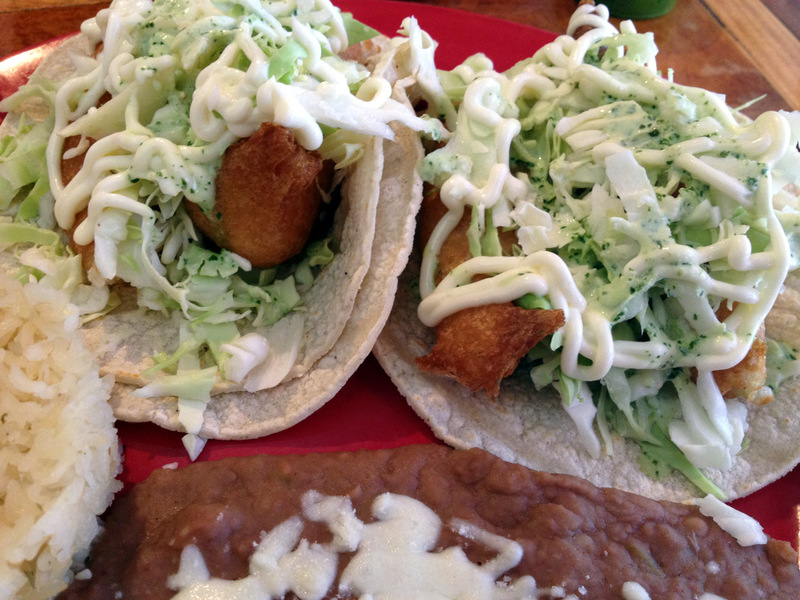 I’ve been on the hunt for the best tacos in Phoenix, and this visit is part of a new series on taco shops in Arizona. Sam had told me that La Santisima has the best Shark Taco around. Strangely enough, I didn’t order it but I chose the Marlin since it was new, I like it, and also because my waiter recommended it. 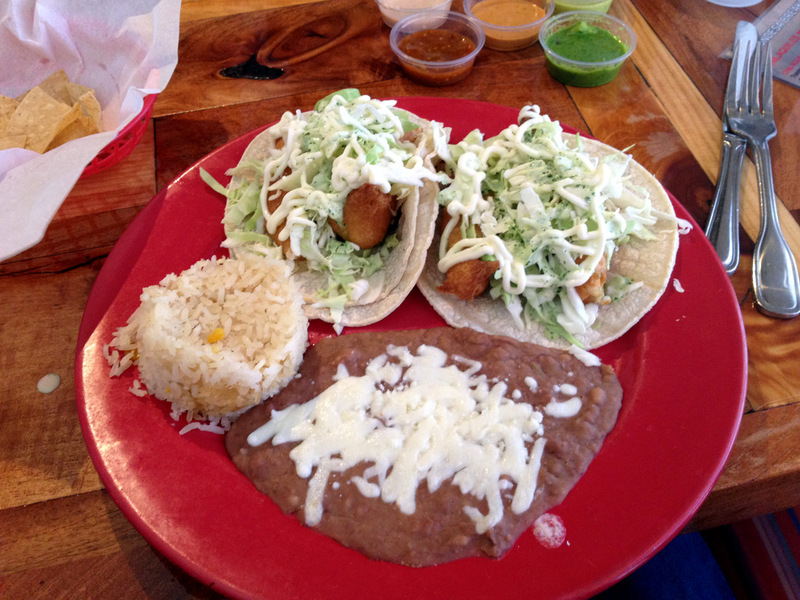 My fish tacos were really great – the rice was also awesome, but the refried beans? Maybe those should go away and be replaced with some awesome beans, or something more tasty. 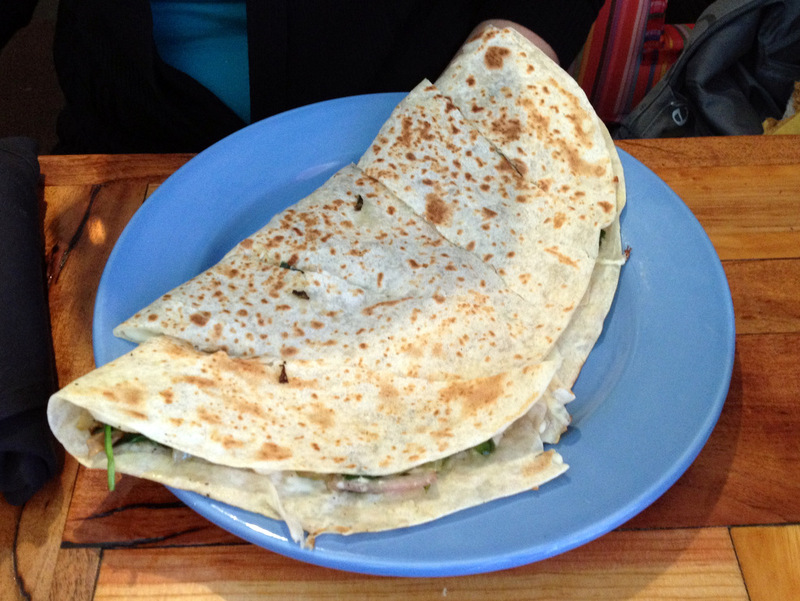 My wife ordered the chicken quesadilla which was absolutely awesome. It can be ordered deep fried, however we didn’t order it that way. My wife at most of it, and my 2-year old daughter at the rest and enjoyed it. One amazing thing about La Santisima Taco Shop is that they have a super amazing salsa bar, and it’s free with your meal. 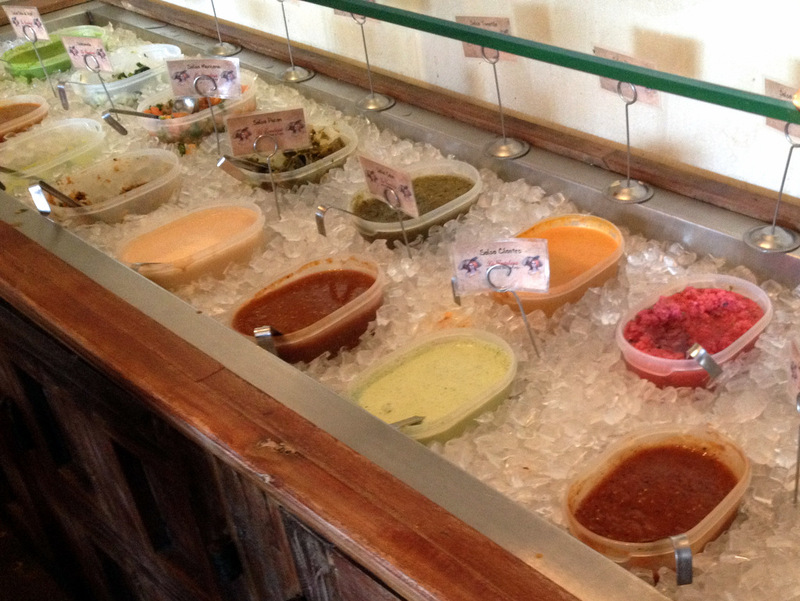 They have almost a dozen different salsas — everything from the traditional favorites, to interesting conceptions like a Pecan Salsa, a Avocado Salsa, and others. Highly recommended! They usually provide one plate of chips complimentary with each table. 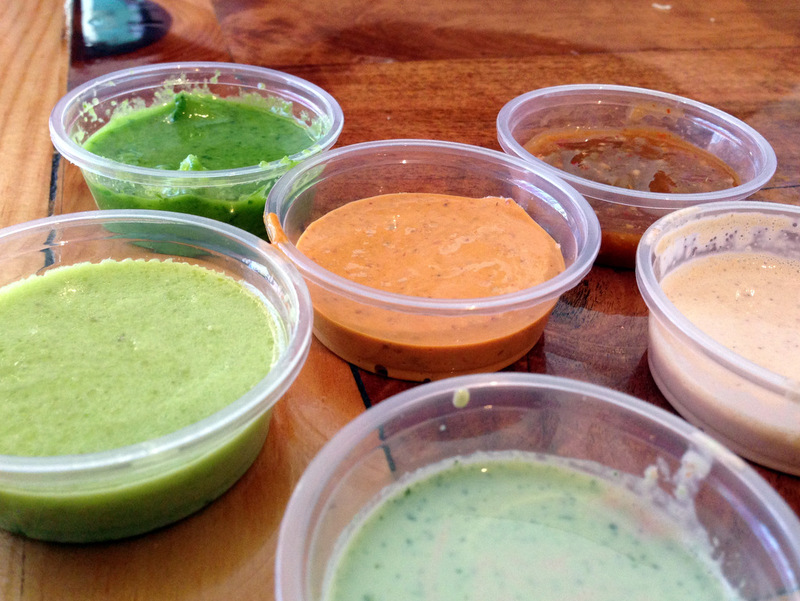 A closeup of the salsas we had at our table. My taco plate… really enjoyed this and will be back! A few notes: The exterior has a funky sculpture of a skeleton with a hat. This is part of the day of the dead culture in Mexico. They have a similar sculpture inside the restaurant. It didn’t really bother me, but my two-year old daughter was frightened by the statue, so it is worth mentioning.